With factories becoming smarter and more efficient, the demand for industrial tech wearables has also increased as it secures and boosts the performance of the workforce. The International Labour Organisation (ILO) estimates that over 6,000 deaths are reported every day from across the globe due to work-related accidents or diseases. This shocking number highlights the significance of safeguarding workers all the more. With factories becoming smarter and more ‘Industry 4.0’ efficient, a new industry of tech wearables has emerged to protect the shop floor staff as well as boost production. According to market analyst, Research and Markets, the global industrial wearable devices market is expected to exceed 2.6 billion dollars by 2023, thus expanding at a CAGR (Compound Annual Growth Rate) of 9.6 % during 2018-2023. Many companies have already introduced the next generation of wearables in the industry. The smart helmet created by the US-based augmented reality firm DAQRI is specially designed for an Industrial Internet of Things ambience wherein humans, machines and data can seamlessly interact with each other in real time to simplify the work. 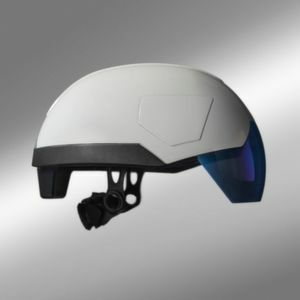 Equipped with multiple sensors, high quality cameras and thermal vision, the helmet also assists the operating engineer to verify the correct functioning of a particular part or machine. The augmented reality helmet is also capable of showcasing 3D content and 2D information superimposed on the real world in order to carry out appropriate measures. An interesting feature of the DAQRI smart helmet is that one can also make and receive video calls from the operative unit in order to solve issues in real time. On the security front, the smart helmet also alerts the workers if the environment is not safe for them. Hence, the smart helmet increases productivity, reduces operational complexity and also ensures workplace safety in an industrial setup. Another remarkable industrial wearable in the market is Pro Glove’s smart glove. Called ‘Mark’, the glove is a ‘Plug and Play’ solution for production and logistics. Via the Mark glove, one can track and trace the parts or parcels by simply scanning the parcels. In addition to this, the process steps can also be documented automatically with the help of the 2D barcode engine. The smart glove is also capable of providing feedback in the form of optical, acoustic and haptic feedback. One of the most stunning benefits of using the Pro Glove Mark is that one can save 2,000 minutes a day in a single warehouse! This enables workers to carry out their duties faster, efficiently and safely. As weird as it may sound, this is for real. Designed by Sapetti for Swiss company Noonee, the chairless chair is a blessing for workers who have to stand for long hours in factories and shop floors. The flexible exoskeleton enables workers to walk and stand freely but instantly provides support like a chair once the worker bends his legs to get into a sitting position. This ensures higher efficiency and also proves beneficial for the aging workforce as the unique wearable avoids excessive physical strain on the worker’s legs and back. These are just a few of the exceptional industrial wearables available in the market. With the growing trend of automation, tech wearables are poised for growth!